This card reminds me of my home in Northern California. We are surrounded by pine and oak trees. I was playing with my suede paper and wondered if I could use dimensional paste on it. I can....well....we all can. Here's what I did. I taped the edges of my Dreamweaver Brass Stencil to my suede paper. 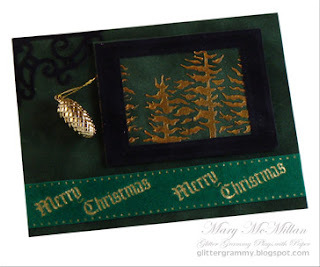 I applied Dreamweaver Metallic Gold Embossing Paste to the stencil. I carefully removed the stencil and to my delight....the process works. Not only works, but works well. The black suede frame was cut using my Spellbinder dies, which are quickly becoming one of my favorite tools. I used the Sizzix Sizzilit Architectural corners as an accent and the Merry Christmas ribbon is from my stash. It's one of those items I wish I'd purchased much more of, because I haven't been able to find more. The pine cone is another one of my stash items. It's funny how you accumulate these items, you wonder why you bought them and then weeks, months or years later, you actually use them. In a few hours, I'll be off to San Francisco. My daughter and I are taking a mini-vacation. We are meeting up with my youngest son, Dan, and we are off to play on the coast.